(Photo by Darren Andrew Weimert) State College Mayor Don Hahn (left), with Town&Gown founder Mimi Barash Coppersmith at The Deli. Last November, Centre County native Don Hahn, a Democrat, was elected mayor of State College with nearly 54 percent of the votes. He succeeds Mayor Elizabeth Goreham, who announced in February 2017 that she had decided not to seek a third term. The mayor is elected to a four-year term and is the presiding officer of State College Borough Council. He does not have the right to vote on any matter before council, but approves or vetoes any council ordinance. The mayor is the ceremonial head and official representative of the borough. Hahn previously served on borough council for 12 years, including two as council president. His stint on council ended when he decided not to run for re-election in 2013. He also spent four years on the board of the Pennsylvania Municipal League, and has been vice president of the State College Redevelopment Authority. Born in Bellefonte and a graduate of State College Area High School, Hahn earned a bachelor's degree in political science from Penn State and a law degree from Villanova University School of Law. He has been an attorney with the State College law firm of Stover, McGlaughlin, Gerace, Weyandt & McCormick since 2003 and has been practicing law in Centre County since 1992. He lives in the borough with his wife, Cynthia, and his two stepchildren, Lauren and Adam. 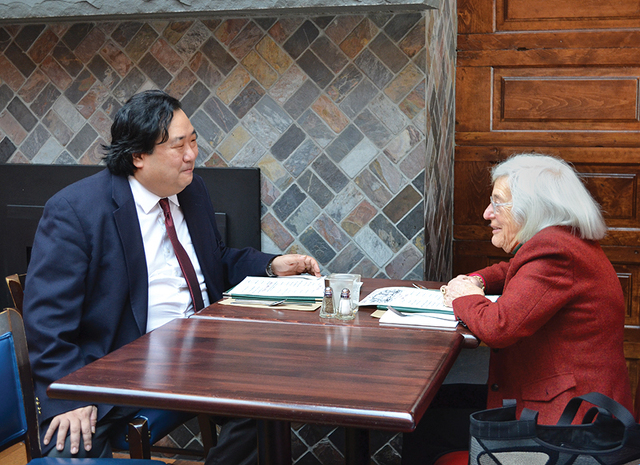 Town&Gown founder Mimi Barash Coppersmith sat down with Hahn at The Deli restaurant to discuss what inspired him to serve in public office, and what he hopes to achieve as State College mayor. Mimi: Well, Don, you climbed the mountain and you got to the top. Don: As a son of an immigrant that grew up here, it’s been very rewarding. Mimi: Well, it’s so timely. Your mother was born in North Korea. And we are today in the midst of such a mish-mosh about immigration and here you are – I can’t help but get a little teary and the chills that run up and down your back and arms when something is good. How do you feel that a child with your background is now the mayor of a wonderful borough? Don: Well, you know the older I get, the longer I live in this community, I am increasingly impressed about the accomplishment of my parents. For example, my mother was born in Japanese-occupied Korea – both of them were actually. My mother’s family was apparently well-to-do, which was not very a good thing to be when the communists took over in 1945. So, I think my mom was just about 10 or 11 at the time. The new regime tended to be rather oppressive to her family; attempting to take their property, to be distributed to others. Mimi: Did it resemble the European Holocaust in any way or was it a different style? Don: There’s a mark of greater evil and intention about the European Holocaust. Mimi: Because of the camp. Don: Right. Exactly. And I think that the North Korean problems tended to be rather similar to the Stalin-era problems. There’s a lot less deliberateness and a lot more negligence and poor planning. And certainly, the fact when the Korean War broke out, my mom was being educated elsewhere from her family – she and her sister were. And the American troops liberated a place where she was being educated for about a few weeks, and my mom and her older sister took that opportunity to follow the American soldiers south. And at the time she was in her teens. Her sister was not much older. So, in many ways when I hear about refugees, I am rather acutely aware that my mother was a refugee in her teens in Korea. Mimi: So were my parents – not in Korea, but they immigrated to the United States. Don: I mean it’s an incredible story that seems to sadly be repeated over and over again. Mimi: And not to get political, but it’s worth mentioning the divisiveness currently provided by the tone of the treatment of innocent children who came here. You know parents brought them here for safety and the future, and we are still on the edge wondering what’s going to happen to those children right now, gainfully employed in the United States of America. Don: Unfortunately, it’s too easy for politicians to lose sight of the human stakes. Mimi: How did you get the bug of public service? Looking at your résumé, you started pretty young to devote part of your life to the common good. Don: My earliest memory was reading a paperback book of presidents when I was in second grade. Mimi: And you were in second grade in State College? Don: Actually, my dad was on sabbatical working at the University of California, Berkeley, at the time. We went to the hall of presidents in Colorado, which is no longer there – but I have a vague memory of being rather of a know-it-all regarding the presentations and such. But it sparked a fascination in me, with respect to history – American, English, and European. More recently, Asian interestingly. It has sparked in me the desire to be politically involved and also for public service. I remember my first campaign I worked for was Sylvia Stein, 1982. Mimi: I was in the center of that campaign. Don: I had just graduated from high school. I was only 17 at the time. I was actually admitted to go to the University of Pennsylvania in the fall, but I felt that during the summer I wanted to work for her campaign. Mimi: And what actually beat her in the final analysis was she was recommending a hotel tax and to be able to provide more services and tourism. And Lynn Herman beat her. At the time the motels screamed that it would put them out of business. And not too many years after that, what she had recommended then became law and now, the tourist bureau gets money to aid the promotion of things that bring more people to our county. And you have to be old enough to remember the last nail in her coffin was the recommendations of that tax; I tried to talk her out of it, I remember it well. But she would have been very frustrated in the legislature. That was early when there were so few women there, and she was a woman ahead of her time. Don: Oh, absolutely. She was certainly one to put her principles ahead of getting elected. Oftentimes public officials do not always make the best politicians; the best politicians do not always make the best public officials. Mimi: Let’s shift to your public service.You’ve been in borough government for how many years now? Don: Practically since coming back from law school, which means about 24 years. Mimi: What drives you to want to be at the top of the bunch? What would you like to achieve? What is your mission? Don: State College is a very busy place and oftentimes does not reflect on its own exceptionalism, especially as a Pennsylvania city. One of the things I have done when I was campaigning, also on the borough council, is to reflect on the many accomplishments of State College. One of the interesting factors about those accomplishments is that it tends to be created by modest people, who in fact like State College tends to basically drive it forward. Mimi: The environment nurtures people with the desire to give back. And the university plays a big role in creating that kind of behavior. Don: Oh, absolutely. We have the third-largest library system in Pennsylvania, at Penn State. I think one of the things that hurt the most about the NCAA sanctions was its utter neglect of Penn State’s accomplishments as an educational institution. And it’s not only football, it was a wide range of athletics, extracurricular activities, in addition to the education. Mimi: Your predecessors Bill Welsh and Elizabeth Goreham, in my opinion, have left models of leadership attached to their own style; they are very different people. But they impacted on improved relations, in my opinion, between town and gown. We have just been through a horrible battle and it’s not over, with Penn State’s sale of 45 acres along Whitehall Road in Ferguson Township to developer Toll Brothers. Where do we stand today? Don: In many ways we are related and as family, although we support each other, we also tend to bicker a lot together. The Toll Brothers was certainly one example of the bickering, but the reality is, the reason State College is here, is because of the university. Don: And quite frankly, the university has been a very clean employer. Mimi: And a solid citizen of the community. A healthy downtown is very important to the university as well as to the community. That leads me to my next question; there is a lot of turnover in downtown. Should we be afraid? Should we be concerned? Don: It’s a reflection of the market. It is rather sad to see institutions like Spats and the Rathskeller leave, and prior to that, we lost Danks, G.C. Murphy’s, and other icons. Mimi: But change happens all the time. Is the amount of change we are experiencing a sign of anything different from normal? Don: One of the most disconcerting parts about the transition of the downtown is that it's becoming less and less three-dimensional. It used to be a downtown for students, tourists, and residents. I’m sort of fearing that the residential component is becoming less and less obvious. Mimi: It's challenged each time a typical retail facility exits. Don: Oh, absolutely. A lot of the national retail strategies have actually been aimed at decimating downtowns. We have two Walmarts within a 3-mile radius and I noticed that it’s a pattern they seem to repeat in for example, York and Lancaster. And York especially has been hit hard by that strategy. Lancaster has quite a few empty storefronts themselves. Mimi: Looking at the location of the former Spat’s/Skeller building, with so many pieces of real estate being merged together for massive 12-story, mostly student-oriented facilities, one can’t help but wonder, and perhaps fear, will the borough make it possible at some point to make that particular corner end up looking like the intersection of College and Atherton? Don: That certainly is a great segue to the rezoning that the borough is contemplating, and it’s in its early stages. Mimi: It’s a big, controversial job. Don: Oh, absolutely. The current owners are somewhat restricted by a 45-foot height limit that borough council placed on a lot of College Avenue and the hundred block of Allen Street. Quite frankly when I was on council back in the late 1990s, and it was done wisely to help preserve the nostalgia. We should not underestimate the value of Penn State’s alumni and their appreciation of the downtown as they remember it. There will be some pressure to rezone it, to allow for greater development possibilities. One of the wise things the borough has done – and I don’t think they have done enough – but it’s to require that as a condition for development of student housing is ground-floor retail. Mimi: They do that pretty much in all of these that have happened. It’s interesting to note that there’s only one retail tenant there now in the Metropolitan. Don: Well, then it’s an opportunity for entrepreneurship. If they do not wish to tolerate empty spaces and get some income, they could lower the rate. And another requirement is affordable housing. Mimi: That’s all over the borough. Don: Yeah, true. But essentially any development of a certain size is required to have 10 percent that’s affordable. Mimi: But that doesn’t even scratch on the needs. It's a compromise. One of our major problems is that the town of State College is much bigger than the borough of State College. It’s huge. It has five different governments. It’s old-fashioned to do it that way. It's not something that will make today and tomorrow better because we have the politics of the borough, plus, is it four surrounding townships or five? Don: If you are just counting the growth boundary, four surrounding townships. Halfmoon Township is completely outside the growth boundary. Mimi: What do you think about beginning to plant seeds in a collaborative way on consolidation? We waste a lot of money and energy the way we are doing it today. And a lack of cooperation and collaboration that’s very meaningful. Don: The 1968 constitution as imposed has resulted essentially in we’re being the right size for the borough 50 years ago. Tremendous growth has occurred in the last 50 years, and a lot of it has occurred regarding surrounding townships, and they have their very individual philosophies, which in many ways are very inspiring and diverse, but in terms of efficiency, it is problematic. Mimi: Efficiency, planning, results, capability to think in broader and more logical ways. I would challenge you to think about providing some leadership and provide the impetus to at least get us talking about it. Don: Well, when I was elected to borough council in 1995 there was a referendum in favor of consolidation and unfortunately, it sort of illustrates a lot of pitfalls of the process. First, I remember that New York City used to be, not only Manhattan, but also Brooklyn, the Bronx, and other boroughs, and when they merged, they had a rather clear charter that was drafted by various intelligent people that they could vote on. When in fact, unfortunately, in State College that is absent, that is not an option for State College – either we adopt the third-class city charter, which a lot of the townships found fault with, and the borough as well. Or we don't consolidate; that's very unfortunate. Mimi: I see this wonderful Launchbox idea that [Penn State President] Eric [Barron] has stimulated – that has involved a sense of cooperation among all levels of government who believe in progress, and that’s liable to be an incredible example. Don: One of the disadvantages of being several municipalities is that developers are probably able to play off one against the other in terms of zoning conception. Mimi: Well, it's all about money, but that can be worked out. We are on the cusp of something we have no idea how great it can become, but I believe it has that potential. And it’s what makes me think about the consolidation issue again, because it will improve housing all over the district. And who knows, maybe from all of this, some real, positive workforce housing will evolve. I would encourage you to try to be the catalyst to those conversations beginning again, or getting revived. Don: I’ll certainly try. I am definitely in favor of consolidation. It would be the optimal approach. As our Centre Region COG executive director Jim Steff once said, “Oftentimes the good is the enemy of the perfect.” I think interestingly enough the regional cooperation that actually occurs in State College is a model statewide, and in many ways, I am wondering to what extent that has dissipated the momentum towards consolidation. But certainly, consolidation would have been an efficient path. I know that one of my successors as council president, Jim Rosenberger, had been a very big supporter of consolidation and asked me if they formed a consolidation committee would I agree to be a member, and I said absolutely. Mimi: I believe the conversation must begin. Don: I think 20 years ago, there tended to be quite a political dichotomy between the borough and the townships. There was a lot of friction. In many ways the political identity of the borough has been transformed into one that has been expanded along with the population throughout the Centre Region. My recollection, back in the 1990s when I was first elected, was that this tended to be a very moderate Republican area that would be receptive to ideas of both parties. I am finding that the borough is becoming maybe less so, whereas the townships are becoming more so. The party registration still favors the Republicans in the townships, but certainly they’ve been very progressive, pro-education, pro-environment, pro-diversity. There are a lot more shared interests and values. If I can ask you a question: do you have advice as to improving town-gown relations, and what the mayor can do? Mimi: I don't know, maybe examine the possibility of periodic town meetings where leaders from the university and borough get together in open conversation about our future. Inclusiveness; people sometimes don't feel included, and maybe we have too many meetings around here, but maybe a quarterly open house, where experts from the university and representatives of government leadership talk about important problems of our present and future. Is our water threatened? How far behind are we on some things that need more of our attention, and what input do people have? I just think we need more conversation; we have wonderful people on both sides of College Avenue and we don't use them well enough, often enough, together. That's the only thing I can think of. Mimi: We live in a great community, and I think we both appreciate that. But our great community has to look ahead with greater balance, hope, and performance, in my opinion.